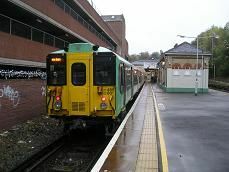 Purley station on the main line from London to Brighton is a typical junction railway station with two island platforms in the middle of two normal platforms and has red brick Victorian station buildings. The train leaves Purley station four minutes late as there is a goods train on the track running round from the London Cement Sidings to the north of the station. We leave from platform 6 and leave the Brighton mainline straight away going in a southeasterly direction. It's not long before we come to Kenley. The original station buildings are all boarded up, but it has an unusual design of gothic arches in it. On the other side is a more traditional red brick building, which houses the waiting room and ticket office. We now move into a very leafy valley with plenty of suburban housing on the right side of the track and industrial units bellow on the left. There is also an old quarry to be seen on the left shortly before we enter Whyteleafe station. As it's October there are plenty of leaves on the platform, which contrasts with the white panelled station building. I wonder if that's where the name comes from?!! It's only a short distance to Whyteleafe South station. There is the original red-brick building on the left, but a white coloured private house on the right. We now travel parallel to the A22 towards Caterham. There are forested hills on either side of the track now with mores housing lower down in the valley. The driver has done well as we arrive at Caterham only about a minute late. The station at Caterham is a two-platform island type with an old yellow building in the centre. The station is somewhat overlooked by a large multi-storied car park to the east, which has graffiti on its walls. But there's over twenty people waiting to get on the train which is a good sign of a well used railway.